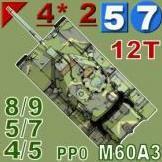 There is no M2/3 or M2A1/ M3A1. No, there isn't. What's the bug? I think its an oblique way to get something that he has put on the wish list, moved up in the queue by implying that the fact that the vehicles aren't represented is a "bug". This is what happens when you drink too much Vodka and meant to put it on the support side and was thinking you were pretty slick! I regret any trouble I may have caused. Having a look there I think you did put it there, and then it was moved here once they worked out it wasn't really a "support" issue.